It’s hard to believe that it could be 2013 already. But I’m always surprised by how fast time is going. Is it a sign of age?? Could be - I’m there! This picture is a pure Boyd production!! 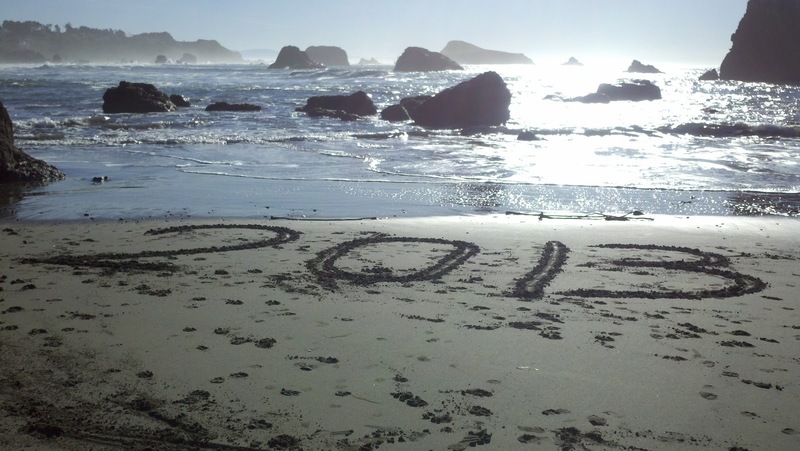 It’s 2013 written on our own beach, the picture was taken by my DH up on our deck. Coordinated by cell phones!! Truly, a 2013 production!! And a good thing too – because the tide opportunity was short – I could not have gotten down there, drawn out the numbers and made it back up to our deck to take the photo before the tide washed away the numbers. That l-o-o-n-g log that has washed up on our beach this week is an amazing 72 ft long. I walked it off in my new waterproof boots – the roots were in the tide! It just makes you wonder how the heck that log got to the ocean? The rivers aren’t that straight and wide along the coast. AND then how did it get thru all the sea stacks to sit right there – so we could wonder about it!!?? In case, you couldn't see the actual year in the sand - it was a l-o-o-n-g shot from the deck! Our holidays got a mixed review this year – we passed around a tummy flu and L’s family lost a beloved pet. There were lots of fun moments and memories; but all in all, we’re glad to be past it!! I think my Notebook computer is on it’s last legs. It’s made blogging a PITA these last few months. That’s my excuse for scarcity of blog entries and I’m sticking to it! No new computer in sight - but I will resort to the desktop if needed!! We’re back at the coast and the weather has been pretty awesome. Sunny days, walks in the forest and lunch out on the deck. DH is actually golfing as I type!! It just makes me wonder what’s coming up to ‘average this out’!! Must be all those years in Nebraska where the good weather was just setting us up for some really bad weather! And of course the memories of past March monsoons here at the coast. DH and I celebrated our 40th wedding anniversary December 28th. And they said it wouldn’t last!! Someone asked what we attributed to our longevity – my DH said, “Don’t pay close attention! !” Hmmm, I wonder what happened to “find the right mate?? ?” But it’s definitely a cross between luck and working hard to keep close. When we got married, an old woman at our church wrote on our card: “Marriage seems like it should be 50-50 but sometimes it seems like 80-20 from both sides.” It was confusing as a young bride … but it sure stuck with me – obviously, I still remember it 40 years later. And it helps to remember the percentages are not always on your side. I’m the first to admit, my DH spoils me rotten! I’m lucky to have found him and luckier to get to keep him!! Here’s to many more years together! December went fast but there were a lot of projects worked on. I finished the Beach Nana and Beach Papa Christmas stockings and I’m happy to report – they even had presents in them at the family celebrations! An auspicious beginning to be sure! First up on the 2013 list is to finish the Grandkiddo’s stockings to hang with them here. I even have the stocking body made for the new little one to join us in April – name to be added later! I machine quilted “Reminiscing” on my DSM and am pleased with the results. I love the quilt and it looks awesome in our condo. The pattern was Reminisce by Lori Smith [From my heart to your hands]. Scrap Happens, my small group in Lincoln, decided to divide the outer border blocks up and exchange them with each other. That was 6-7 years ago. There were 3-4 Reminisces hanging at the Lincoln Quilt Guild show [over-achievers all] and they were in a row; different over-all colors; and different ‘sides’ on top. Well, we had to argue with many fans that they were all the same pattern!! Even with identical blocks in each quilt. Color and value makes quite the difference. And although mine wasn’t finished until December –oh-so-many-years-later; mine is not the last of the 9!! One gal made a very cute quilt with the exchange blocks – didn’t attempt the pattern at all. One is still being quilted [for years] and 2 are still in pieces – and there are A LOT of pieces on this one! It was definitely one of those projects that when finished, made you wonder why it took you so long??? Very rewarding to see it done!! When I was in Newport in November – S, my very creative friend, had the most interesting thing hanging in her window. 3” circles cut from double-sided scrapbook papers. Sew 3 circles at a time down the middle; no space between trios. Fold 1st and 3rd circle out to make it 3-D. Very clever. I found the double sided paper at Michaels; found a friend that had a scrapbook cutting machine; she cut my circles perfectly for me! Then sewed them together New Year’s Eve. They turned out so-o cute. I left LONG threads at the beginning, alternated sets of papers; and just kept sewing it in a line. [You hang these by the long threads.] When I was down to just one set of each trio of papers; I stopped and left LONG threads at the end. I divided roughly by 3 – I have a set of 17, 18 and 21!! I cut between the circle sets. Hung the first by the beginning threads; hung the last set upside down by the ending threads and I added one more trio of circles with long threads to start to the middle set. I sewed the new trio and then over half way on the 1st in the string – worked out easy-peasey!! And it’s so-o very cute. Even DH thought it was cool, but was also relieved that it was going to Miss P’s room!! Of course, it made me think that double-sided Christmas scrapbook papers. Cut in circles in the 1 ½ inch vicinity would be awesome garlands around the Christmas tree! We’ll see if that makes the cut of ‘Christmas to-do’s next year. You know the project is successful if you think of more of the same type of thing you “Need”!! Trends?? I over-committed to BOMs this year! And I never join those ... oh dear! But all 3 - yes three!! !- are sew it and keep it variation. Is that a new trend?? I'm in a 6 month sampler-type BOM here in Brookings. I'm going with a patriotic theme. When I re-joined Newport Guild, at the beginning of the meeting I signed up for an applique flower BOM. I'll tell you all about it later this month - there's a notebook with all the patterns in it!!! Truly the most organized BOM I've ever been in!! Then at the end of the business meeting we were invited to make Mariner's Compass - paperless-paper-piecing style. Now how could I NOT sign up for that!! I love MCs and adore PPP!! Oh, then there is the House BOM from Quilt Mania last year. We're behind the times, but raring to go!! P and I cut and fused our first block last weekend. So cute - it makes me smile everytime I walk past it on the design wall. Lots of detail and embroidery on these. Adorable, yes?? My block is the top one, P's underneath. Next post will be the Annual Round-Up - and there are some pretty impressive numbers adding up! Surprised even me.